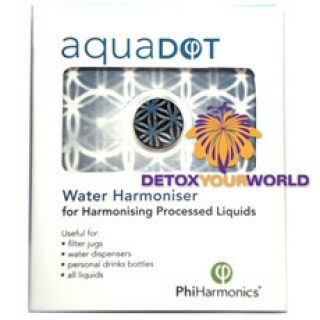 A harmonising DOT to restore the natural vitality of water and liquids -- the aquaDOT is attuned to the vibration of living water. Water is essential to all life on our planet. It is very impressionable. Not only does water take on the shape of whatever surrounds it, it also takes on the vibration. In the case of EMFs, distorted electromagnetic information from communications technologies can become imprinted in the water and liquids we use and consume. The aquaDOT is designed to refresh the natural energetic structure of water, removing imprinting from EMFs and other sources, to give your body the best chance to renew itself on a cellular level. Imagine the vibrancy of water straight from a crystal clear spring, carrying the joy of wild water. Now, imagine this same water energising all the functions water has in your life. This is the purpose of aquaDOT. As with all the DOTs in the energyDOT range, aquaDOT is versatile and multifunctional. The first place to use aquaDOT is on your drinking water, either on your water filter, dispenser, bottle or cup which is your everyday source of water.Then think of all the ways you use water, or liquid products that have a high water content –- and add an aquaDOT. If you enjoy cut flowers, place an aquaDOT on the vase to retune the water and enjoy the flowers for longer. The aquaDOT will stick firmly to a clean dry surface. Containers with aquaDOTattached and can be washed in normal washing up liquid -- we don't recommend cleaning in a dishwasher. 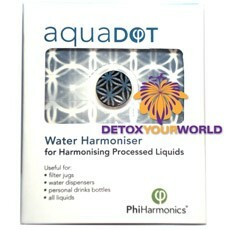 Water and other liquids require only 1-2 minutes to adjust with aquaDOT's harmonising effect. Longer exposure to aquaDOT can produce an improvement in taste quality as well. energyDOTs are ideal for anyone answering 'yes' to any of the above -- and countless energyDOT users already enjoy the benefits. energyDOT magnetic discs are programmed with naturally inspired frequencies. They are supercharged with subtle energy to strengthen and support your natural flow of vital energy. Different DOTs have different roles. 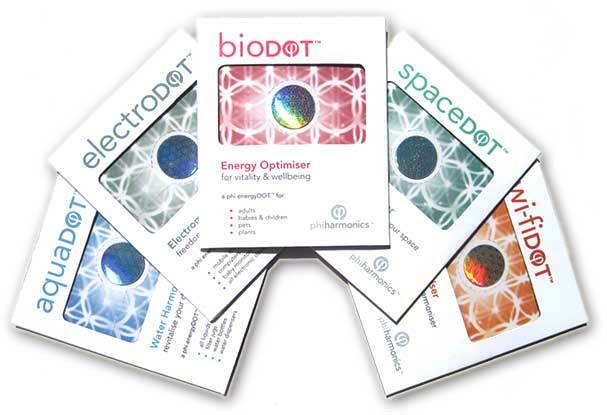 Wear a bioDOT under your watch, stick an electroDOT on your electronic equipment, or put an aquaDOT on your water filter. EnergyDOTs are designed to revive your energy and can help relieve the side effects of exposure to the technology we all enjoy. Electromagnetic fields (EMFs) from mobiles phones, cordless phones, computers, TVs and everyday electronic equipment can interfere with the essential electrical communication between cells in our bodies. Daily exposure to EMFs has an impact on our vitality, energy and health. You can use energyDOTs to clean up man-made electro-pollution as well as strengthening and balancing your own energy field. Tests have shown significant benefits from using energyDOTs.